Founded in 1964, Crystal Pools is one of the region’s oldest and most trusted providers of in-ground and above-ground swimming pools, spas and hot tubs. Over the last five decades, Crystal Pools has won numerous awards for the quality construction and design of our pools. We’re honored to be an 8-time winner of the prestigious Aqua 100 Award, ranking us among the top 100 pool & spa companies in North America. Throughout our rich history, we’ve continued to grow our business to meet the changing needs of our customers. But our key mission has remained the same: helping Central PA homeowners turn their backyards in their own vacation paradise. In 2014, Crystal Pools celebrated its 50-year anniversary in the swimming pool and hot tub business. 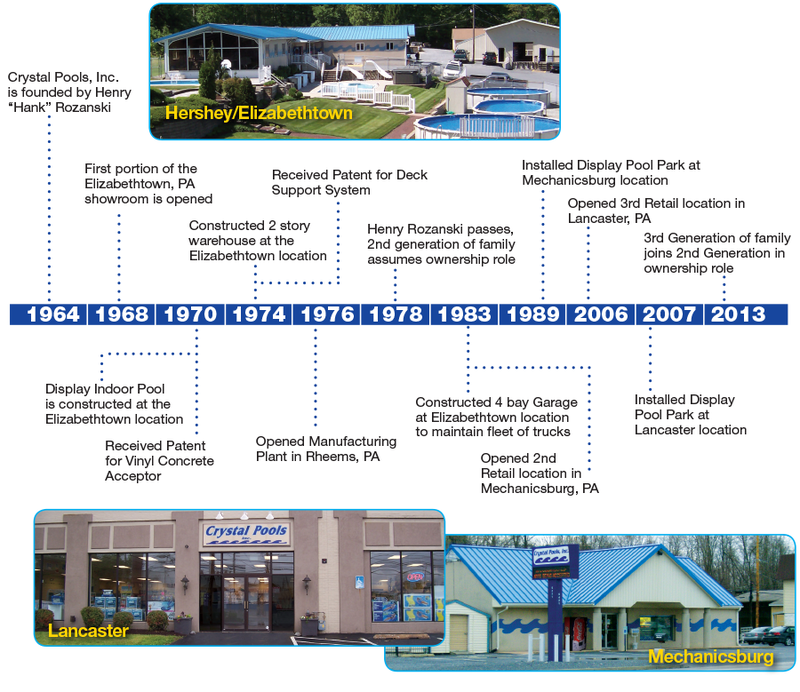 Today, the company is still based where it all started in 1964 in Elizabethtown, but it has also added retail stores in Mechanicsburg and Lancaster. Each location showcases the area’s largest full-size pool parks, multiple lines of hot tubs, maintenance chemicals, games, toys, parts and accessories. Initially specializing in pools, Crystal Pools has adapted to customer’s needs over the years, expanding its offering and expertise to include the newest spas, hot tubs and one-piece fiberglass pools. As a family-owned business, Crystal Pools understands the importance of unwinding from the chaos of daily life and enjoying time with family and friends in the comfort of your own backyard. That’s why we strive to bring homeowners the very best in relaxation, whether it is with a beautiful in-ground pool, high-quality above-ground pool, or the relaxing feel of soothing jets from a hot tub. Through the years, Crystal Pools has received more than 50 awards on regional, national and international levels. We have been featured in numerous trade magazines and have been inducted into the prestigious Aqua 100 Hall of Fame, which honors the best pool & spa companies in North America. Our goal is to provide superior products, coupled with superior service at competitive prices. In Central Pennsylvania, the choice is clear – there’s only one name in pools: Crystal Pools.